Definition: Carthaginian general and one of the most feared enemies of Rome ever. 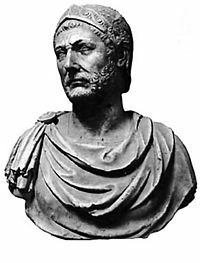 He was introduced to the hatred of Rome by his father, Hamilcar Barca, and he swore to fight Rome all his life. He is famous for his brilliant victories in the Second Punic War, including Lake Trasimene, Trebia River, and Cannae. Desperate to invade Rome but unable to sail across the Mediterraenan (because Roman ships ruled the seas), Hannibal took his troops through Spain, over the Alps, and down into northern Italy. His troops ravaged Italy for years, hoping the peoples surrounding Rome would band together against the Romans. However, Rome stood fast. Finally, Roman troops, under Scipio Africanus, took the battle to the Carthaginian homeland. Hannibal got home in a hurry, and the two forces fought Hannibal’s final battle (and first defeat) at Zama. This ended the Second Punic War and made Hannibal an outcast. He fled Carthage and never returned.